I decided to go to Turkey Creek Sanctuary this weekend, as it had been a while since I last checked in. The area had some weather move through that made me hopeful some early migrants had made a pit stop overnight. Hope springs eternal, as the saying goes. It turned out to be another eerily quiet morning for the majority of the sanctuary. There were pockets of Northern Cardinals and the winter residents are still hanging on, though their numbers are much lower. Any activity was in widely spaced pockets, with only a few individual birds. 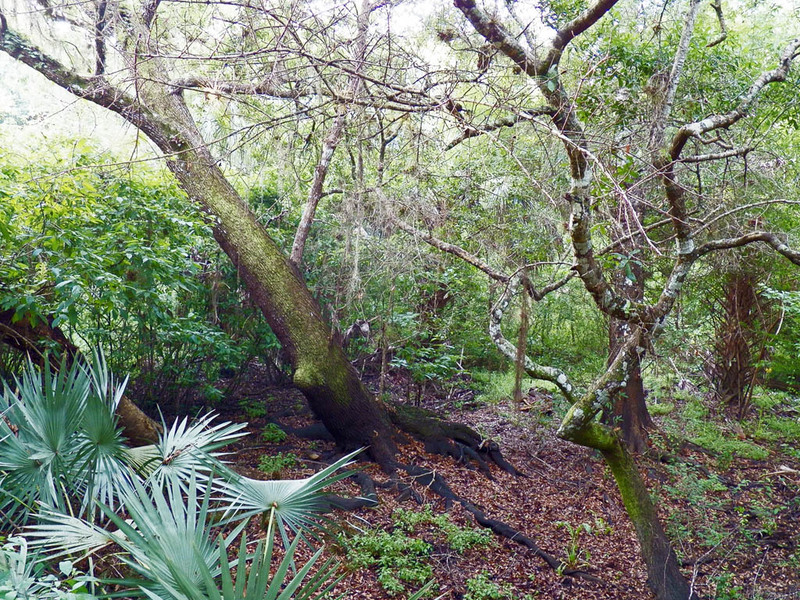 Some typical Turkey Creek Sanctuary habitat. Besides the cardinals, I encountered a couple of Gray Catbirds in the Saw Palmetto along the boardwalk loop and I could hear Northern Parulas up in the canopy. I also came upon small bands of Prairie Warblers both on the boardwalk loop and later, along the Sand Pine Trail. I heard Yellow Warblers and Blue-headed Vireos together as I approached the canoe deck. It’s been a mild source of frustration for me that for a few years in a row, in the same general location, I can hear Yellow Warblers high in the canopy but have been unable to get any decent binocular views, to say nothing of photographs. 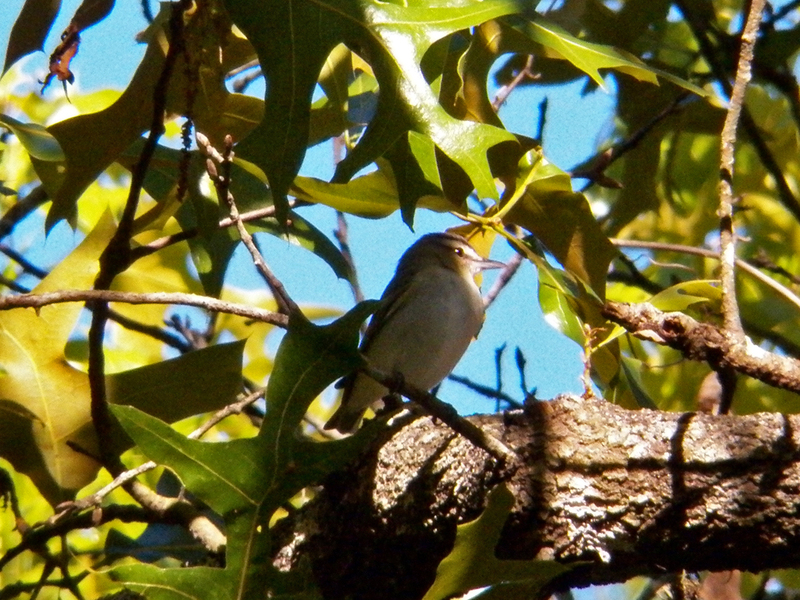 Some patient watching did get me some good looks at the vireos singing and hopping below the canopy, though. The Blue-headed Vireo’s song is a bright, “Cheerio! See you later!” (at least that’s how I hear it). True enough, this is the last view I had of it before it moved out of view. I saw almost no birds at all along the creek overlook boardwalk (though there were quite a few Northern Parulas singing). I spooked an Osprey down by the boardwalk on the Flood Plain Trail, but otherwise there were no birds present there either. I met up with an out-of-state couple who were visiting the sanctuary for the day. They asked me if I had seen “anything good,” and I had to admit it was seriously quiet. They had heard that the sanctuary was a decent place for spring migrants. I explained that it was probably still a bit early for most of the migrants, but that also the sanctuary has been very quiet for a couple of years now, even during migration seasons. But, as I told them, you never know what you might see on any given day. I had two surprises on the Sand Pine Trail which would later come to cause me some small embarrassment. First, somewhere near the mid-point of the trail I heard some distinct whistling notes close by. I knew the birds had to be very near, but I was not detecting any movement. I noted, in the back of my mind, that further up the trail I could hear something that sounded somewhat vireo-like as well, but I was trying to focus on the birds at hand (or at ear, I guess). Finally, after trouncing back and forth on the trail trying to get a good vantage point I saw movement and got a look at a brown warbler skulking in the mid-story, and then another nearby. Based on the facial pattern and overall shape (and later confirmed when I played the bird’s song) I identified the bird as my first of year (FOY) Swainson’s Warbler. How exciting! A spring migrant after all! I took a few photographs that I thought would be pretty decent and clear enough to convince the (at times) über-skeptical e-mail lists that I had indeed seen Swainson’s Warblers. This would come back to haunt me. I walked further up the trail, and again heard the vireo song, but much closer. About 10 or 12 feet up in some of the smaller trees I saw two Red-eyed Vireos. One of them let me get some great binocular views before moving off a bit. The light and shadow through the trees made the photographs a bit tough, but I got some good shots, including this one. At this point I did not realize that my Swainson’s Warbler photographs did not properly write to my camera’s memory card. 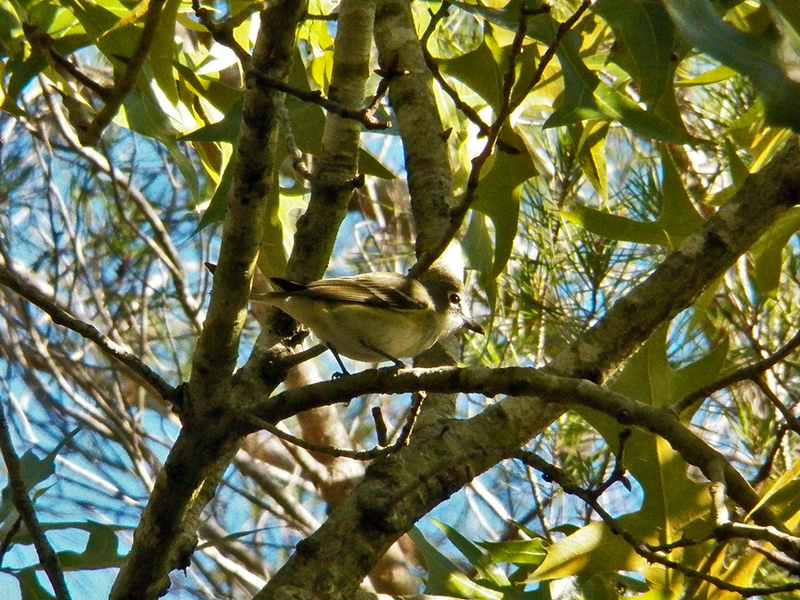 Later that afternoon I went to post to BRDBRAIN and FLORIDABIRDS-L that I had seen FOY/FOS Swainson’s Warblers, and only quickly looked at what photographs I had pulled form the card, I attached this vireo photograph! As you can imagine, I received some properly amused replies that I had actually seen a Red-eyed Vireo, not a Swainson’s Warbler. You can imagine my dismay as I checked and sure enough, in my excitement I had posted the wrong photo. I had not realized I had no Swainson’s Warbler pictures! I quickly posted another message to the e-mail lists explaining my error, but I am sure it’s already added to the body of lore I’ve managed to accumulate there (to examples: I once jumped the gun that a winter American Goldfinch was a Snow Bunting, and my hearing two Carolina Chickadees at Erna Nixon Park was roundly scoffed at by a couple of list members). This isn’t the first time my camera (or the memory card) has failed me like this. Since my trip to Minnesota the camera hasn’t been right. Whether or not it was due to the cold, or just a coincidence, I seem to lose some pictures and the controls react more sluggishly than they used to. I heard more Prairie Warblers on the Sand Pine Trail, but had my best photo opportunity interrupted by a loud, if well meaning family. I couldn’t stay too angry about it, since the kids were genuinely interested in nature and the wildlife they might see. They weren’t being obnoxious, and the parents were encouraging this in them. I also reminded myself that the bird photographs are icing on the cake. It’s great just to be out and see these magnificent creatures. As a last minute decision, I went down to McKinnon’s Way and then over to the weir and canal, but there wasn’t much happening there either. The boat ramp has yellow caution tape at the entrance to the path leading to it. I peered around it and saw that the decking had been removed. I don’t know if this was from the minor flooding a few months back or from the planks being removed for repair (the wood seemed to be a bit rotted from what I could tell). The creek level is down to normal now, and the lower and newer parts of the ramp’s deck seem fine, if a little more crooked. 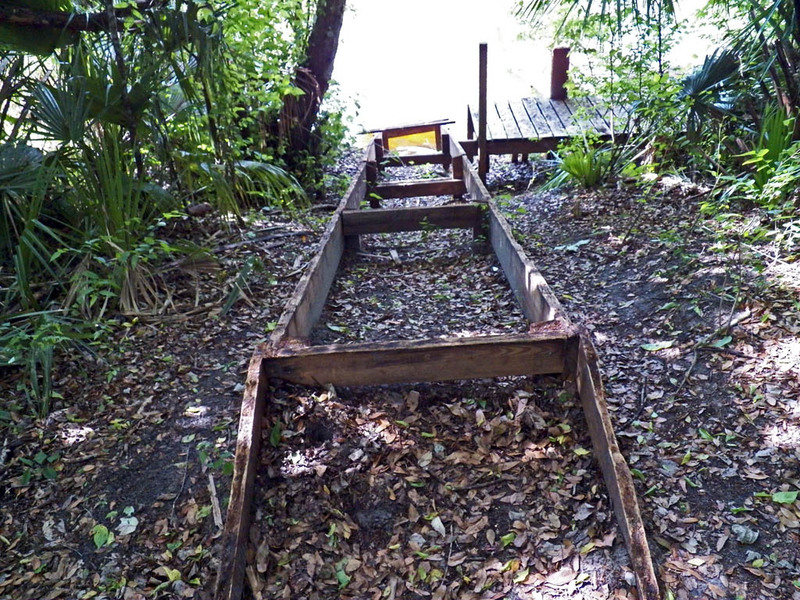 Remnants of the “emergency” boat ramp. At the canal and weir there was one Little Blue Heron and one Cattle Egret. The canal level was surprisingly low. We’ve had a relatively wet winter and early spring, but the past few weeks have seen some above normal temperatures with little rain. This must have been enough to drop the water level down quite a bit. Even the heavy showers from previous days must not have made much of an impression. Only one discharge was open on the weir, and there were turtles stacked up at the edge of the others, taking advantage of some prime basking real estate. 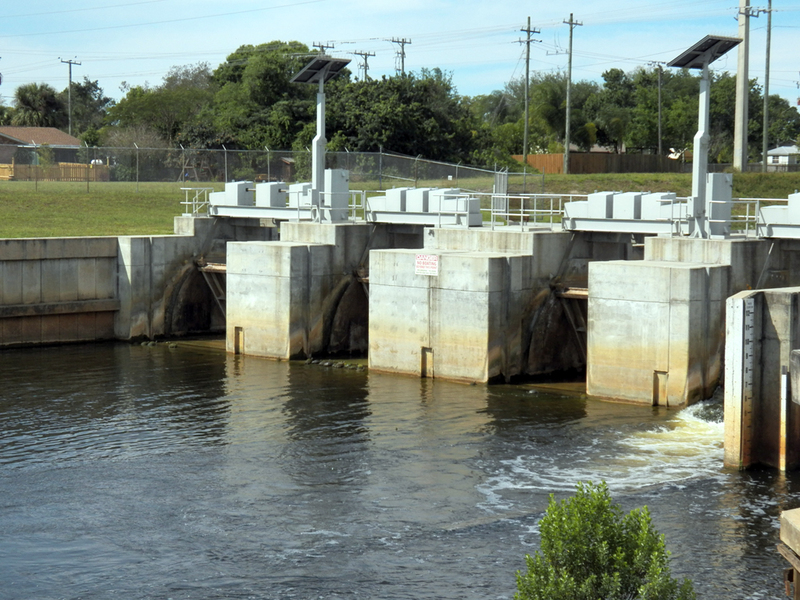 Turtles bask along the discharge openings of the weir at the Melboune-Tillman Canal and Turkey Creek. 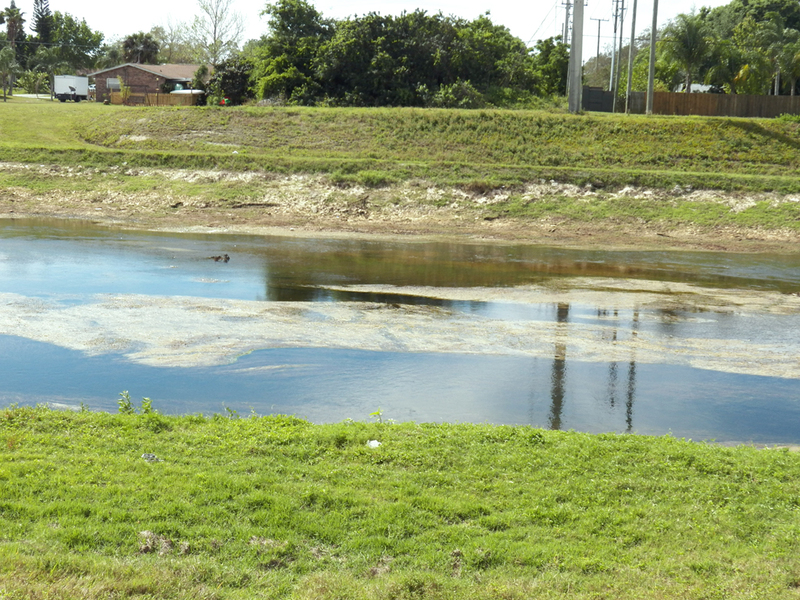 The low discharge can be explained better by looking at the next two photographs, showing how low the canal level is. The canal bottom is starting to get exposed. 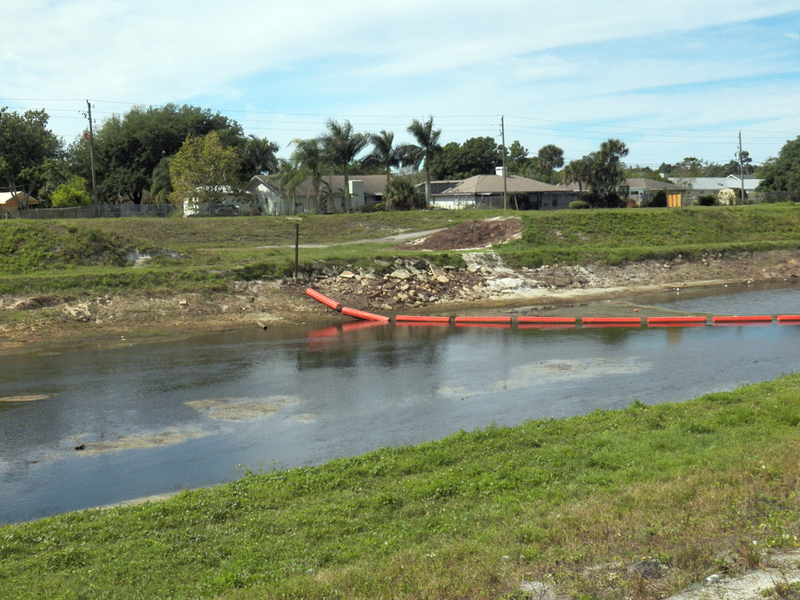 The floating barrier is resting on the bottom now. I stirred up some more cardinals on my way back toward the sanctuary entrance, but saw little else in the way of bird life. I saw one Black Racer (a snake species), which quickly slid away from me before I could even get my camera up to take its picture, and of course the lizards are ever prevalent. Here’s the total species list. Except for the Prairie Warblers, most of these were single or pairs of birds, widely spaced apart throughout the sanctuary. The lack of bird life here and in many other parks is perplexing. Certainly the amount of insect and reptile life seems to be about the same, and the plants (apart from some more invasive species than a few years ago) seem healthy. There are still very large gar in the creek, and the manatees come upstream as they always have. But something is affecting the birds’ ability or willingness to stop and stay at many of the areas they used to frequent. Last year Shirley Hills told me that it was the quietest year to her recollection, and she had been birding Turkey Creek for decades. I really hope things pick up in April, as the main body of spring migrants make their way through. The birds have either found better places to stop or are vastly reduced in numbers. How much of that would be part of normal population fluctuations and how much from something we ought to be alarmed about isn’t something I am able to know as yet. Posted on 2015 March 30 2015 April 27 by Lonely BirderPosted in BirdingTagged Birding, birds, Turkey Creek Sanctuary.